According to retail researchers worldwide, the shopping revolution has only just begun. Although you sense almost everybody buying at Amazon already, this is just the tip of the iceberg. In the next three years, online shopping is about to explode. To keep your head above the water as a retailer you will need to take the step and eventually install an online subsidiary of your brick and mortar store. The designers from Forix Webdesign took three of the most successful softwares that promise to achieve just that and put them head to head in a comparison. To not steal too much of your time, this comparison comes along in the form of an infographic. A decision for one or the other CMS to power your online store should not be made using your gut feeling. Once you’ve put all your eggs into one basket, it will be almost breaking your neck to reverse this decision. So, better think a while longer and get informed. And: never install an ecommerce solution without professional help. Chances are, design agencies will recommend you Magento, osCommerce or OpenCart, at least – if not solely – among a few others. It’s not a waste of time to get to know these three contestants a little better. That’s exactly what the following infographic is aiming at. I especially like the comparison table, where they break down individual features. Though this can only be an overview that needs more profound analysis, it definitely is a good starting point. Let me weigh in my own two cents before I step back and give the floor to Forix. My own experiences with Magento and OpenCart have made me categorize these two quite clearly. Magento is the Typo 3 of ecommerce, where OpenCart is the WordPress. Both are free and have no hard-coded limitations. Both are great systems. OpenCart is easier to handle and faster to set up. It is all in all more understandable and compared to Magento does not need a similar level of initial training. The community is great and support is never a problem. Especially the admin dashboard guarantees for an almost intuitive access to any feature needed. Magento on the other hand is more powerful from a certain range on up. It can do everything OpenCart can and adds to that, e.g. with the capability to handle multiple stores from one backend. This comes at a price and the price is only affordable to those who are willing to invest a lot of initial effort into establishing their online branch. If your perspective is going big on the net, Magento is a valid choice. If you just want to extend your little pet shop into virtuality you might be better off using OpenCart. In case you didn’t know: Magento is part of eBay, OpenCart is coded by a much, as in much smaller team. Now, before I really give the floor to Forix’ infographic I need to correct a few flaws they built into their little chart. The dates of the initial releases of the three contestants got messed up. osCommerce started out in the year 2000, not in 2011. The given date for osCommerce is where the latest version got published. The numbers of websites powered by a given CMS are not valid. Magento covers more than 25% of the market, the other two fall way behind that share. The numbers given in the infographic suggest that they are much closer together than they really are. Magento claims to have been chosen by more than 150,000 customers. How many websites these customers run is another cup of tea. The infographic claims that OpenCart covers 6% of the market. 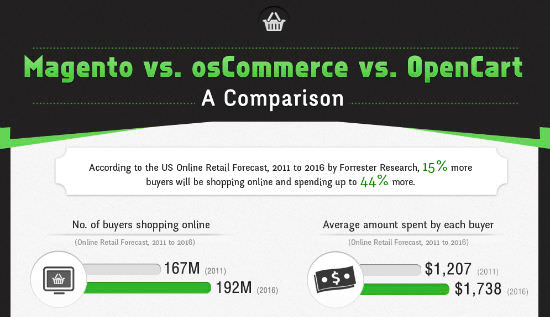 Other analysts see a much lower market share for OpenCart, and a higher share for osCommerce. A little mistake about the latest version of Opencart : 1.5.5.1 and Opencart is mobile responsive with an appropriate theme. There are some pretty obvious errors in the infographic. First is the wrong version for Opencart, and then there are several errors in the features table: Opencart is built on a real MVC framework (more MVCL than MVC, L is for language). There is an entire section of reports/statistics in the admin for a while now (Opencart), also the new file manager is not dependent on Flash, so it might be categorised as HTML5 (Opencart). Other than that, it seems funny to me to compare Opencart and Magento and not include Prestashop for example, since usualy this is the holy trinity for shopping carts, at least in Europe – Magento, Presta and Opencart, unfortunately for them OSC is in a bit of a decline in usage. For the record, i am not affiliated with either one, but i know them quite well :). No Prestashop? Where does Prestashop fit in all this? http://tomrobertshaw.net/2012/11/october-2012-ecommerce-survey/ – over top 1M sites. Furthermore, the release issues are rectified and the changes are published in our blog. Would be of great helpful if you can add a note mentioning the revisions in our Infographic. You’ve missed out a very serious contender that is LemonStand (www.lemonstand.com). It’s been around for a few years now and offers a very serious alternative to all three of the above. Its module and template systems are highly customisable than the ones above (I’ve tried them all). Also the admin interface is nice and user friendly to our clients. Because of these reasons, it’s what we use for all e-commerce projects at our studio. I took a look at LemonStand and would say, they chose the right name, cause it’s truly a “lemon”, hence I’d never touch it. Everything is premium (nothing wrong with it) but nothing has a “demo link” … only a payment link. A bit over the top money pushing and that pushed me off the “interested” list. If you’re building websites for BUSINESS and PROFIT and are upset that a company charges for software that helps you do your job easier/faster/higher quality, you must be from another planet. There’s a demo link in the main navigation, and free trial buttons (to run your own “demo”) everywhere. Perhaps you should go to the optometrist to check your eyes. This comparison is between ‘Free Open Source’ e-commerce platforms. Just a quick glimpse at the site you suggested is enough to see this is a full blown commercial approach so I don’t see where this should fit in? I can’t understand why this three? Prestashop is much, much better than all three!! I’m using it by the years and I also used all this 3 and I can say for sure that Prestashop is best eCommerce solution.. These are great options but there are others out there as previously mentioned. I love ECWID.com which allows me to design and build a complete site, slotting in the ecommerce to my existing designs. ECWID is a realtive new comer, but adding features all the time – recently winning awards in various areas. Definitely one to watch. I’d call that “sneak advertising” (close to spamming). ECWID is a hosted, monthly premium cart, NOT open source. Hence, it absolutely can’t be compared with the 3 here…!!! Personally, I prefer Magento? shopping cart for e-commerce websites. Many e-commerce templates available for Magento look very attractive and professional. I am still learning to develop using magento and having this issue as don’t see the template function ….how? can I make that function available? I am working on a Ecommerce website using magento and just wondering how to hige product prices from non logged users or guest users. Can I get some solution to this problem? Still need to get hang of Magento since I come from a wordpress background. Having used them all, another vote for LemonStand. Yes, it costs a little money, but you save tons of development time compared to using the other systems, and you can get a development license free of charge, you only have to purchase a license when you’re ready to sell products, and it costs our clients less than it would for them paying for development time in other systems.. It has it’s own PHP Framework and you can see and modify the source code as you wish. The commercial aspect means it gets updated constantly. Is this 3 free even if I installed it in multiple projects? I need the easiest and basic one.. Might try opencart..
Has anyone used Digishop before? I know it’s not free but it’s extremely cheap and supposedly “open source”. I’ve been using this since i start my small business because of this benifits Opencart E commere software is robust rich in features has wide range of benefits which help setting up an efficient and flexible e commerce platform so i highly recommened this shopping cart for all the people out there who is about to start their small to medium business.